"Experience the legacy of royalty in Bengal where the past comes alive"
Jhargram is a melting pot of culture, tradition, rich heritage and natural beauty. It is where you will find some of the oldest tribes of this land co-existing together and still keeping their individual identity intact. The enthralling scenic beauty and traditions of Jhargram have mesmerized tourists all over, time and again. It has attracted them to visit the place and experience the culture and life of people who stay here. It is a place where the rivers meet the hills and the wilderness of the forests beckon the exploring travelers. The hill ranges and the thick canopy of Mahua, Teak, Sal and Peasal trees add to the charm of the place. Jhargram has the history of a royal past, the hindu temples and palaces testify to it. 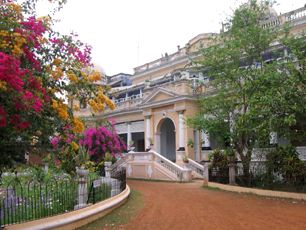 The Jhargram Palace is the current residence of the Malla Dev Royal family. Situated in Jhargram district, West Bengal, it is a structure combining the Italian and Islamic architecture model. About 10 rooms on the ground floor have been converted into a Heritage Hotel run by the family. The Palace is an opulent Italianate structure, set in carefully laid lawns and gardens which was built in 1922 CE, during the reign of Raja Narasingha Malla Dev Bahadur. In the Palace campus, so evocative of a regal lifestyle, the past comes alive. A stay at the Jhargram Palace will bring the legends of the famous Malla Dev rulers to the fore. Here you can experience the royal lifestyle that was once the tradition of the Jhargram Kings. The rich heritage and the history of the royal family is sure to excite guest who are interested to know and explore the rulers of ancient India.